Balakrishna’s rendition of the patriotic song, Saare Jahaan se Achcha has everyone in splits. 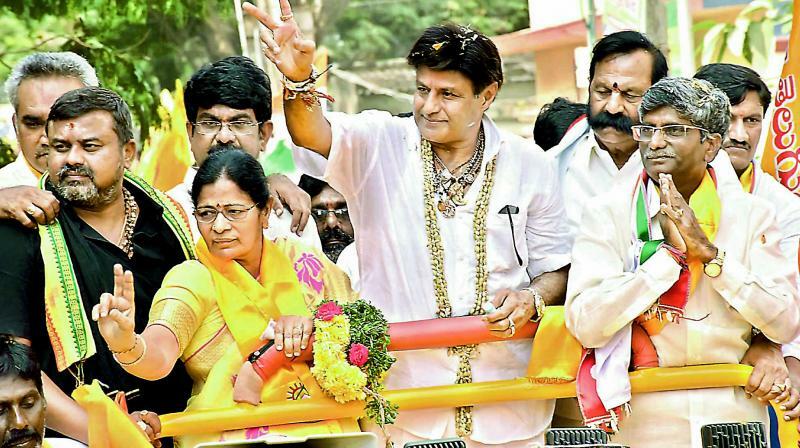 Balakrishna campaigning for his niece Suhasini who is representing the Telugu Desam party. Actor Balakrishna has become quite the favourite of trolls and netizens thanks to his recent take on the hugely popular patriotic number, Saare Jahaan se Achcha. The actor, who is campaigning for his niece Suhasini who is representing the Telugu Desam party, had trolls laughing themselves into knots over his rendition of the song. Videos of the same have now been shared and re-tweeted thousands of times and memes have mushroomed all over but the actor has been giving the entire thing the cold shoulder. Balakrishna incidentally, always tries to speak pure Telugu and often pauses in between his speech to find the right Telugu. Well to each his own is what we say.